Sometimes, the best plan can be to have absolutely no plan. Occasionally, a band can inadvertently create something truly unique and enjoyable that defies all categorization. More often, a band will hastily throw something together that is such a mess that the only solution is to slap a fancy description on it in hopes to appeal to the kind of music fans that are more interested in describing their musical tastes rather than actually listening to them. I can’t even begin to apply the slightest amount of sugar coating on this one. The Captain’s Daughter is unforgivably bad in numerous ways. It is a rambling, uninspired, amateurish collection of jam sessions that barely resembles an actual album. So, of course, you will find terms like “experimental,” “psychedelic,” and “post-metal” being thrown around in a desperate attempt to make sense out of the nonsense. 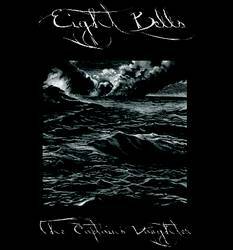 Eight Bells is helmed by Menynda Jackson, whose rudimentary, effects laden guitar work serves as the feeble backbone of this mostly instrumental album. Taking elements from metal, progressive rock and post-punk, the band seem to have all the right ingredients to create something epic or at least interesting. Unfortunately, The Captain’s Daughter ultimately serves as a cautionary example of how a lack of planning can be utterly disastrous. Each of the album’s four tracks feels like an extended introduction to a song that never actually begins. The opening track, driven by a reverb heavy post-punk inspired riff, succeeds only because it feels like the wistful beginning to a fascinating album. The charm quickly wears off with the realization that the The Captain’s Daughter has nothing else to offer. I appreciate that the intention was to create dark, atmospheric pieces of music without relying on traditional song structures. However, Jackson’s dense, repetitive guitar melodies are simply not interesting enough to carry entire songs on their own. I could easily fill another couple of paragraphs detailing this album’s multiple shortcomings. From embarrassingly crude performances (including a number of noticeable drum flubs) to an unnecessarily lengthy ambient section and an almost laughable detour into what could only be described as free form jazz-rock, I have quite a bit to work with. But, in keeping with the spirit of The Captain’s Daughter, I am going to forgo spending the energy to flesh out my ideas and simply let this review haphazardly peter out. Posted March 4, 2013, 11:19 p.m.